Backlinks are inbound links from other locations. Backlinks show a site's value and importance. More valuable, if they come from another high value/high-ranked site. More valuable yet if 'Do Follow' rather than 'No Follow,' although no follow backlinks still count. A backlink can be the visible, written out website address. Or, like an Avatar or Banner, a click-able image linking to a website or another page on the same site. Yes, even internal backlinks have merit. Likewise, backlinks to other valuable sites also increase your sites' worth and is taken into consideration with regards to Search Engine ranking. The listing for this article as found in my Computer/Internet Directory is a perfect example of a proper backlink! * A Website, Social Networking profile, a Blog, an account with a content publisher such as Twitter, Examiner, Squidoo, etc. 1. Backlinking your articles, one of the easiest ways to make money faster, by increasing readership. If you decide to build a website to include backlinks, consider the combination of an affiliate Ad program as well as Google's Adsense program. Utilizing Google Adsense provides a exceptional means of making money online, directly from PPC or PPV advertising. Adsense gives you a bigger percentage of the income generated than you would get from your content hosted by an affiliation with Twitter, Bukisa, Examiner, etc. 2. Obtain the link to an article or page. Do this by copying the link location either directly from your article library or from the title bar of the article you have open. Don't forget to copy the title for the link. You could highlight and copy the article title from your library, preserving the title and link together. Some places will allow you to paste such an active link; Blogger, Google Sites and MySpace for example. Unless you already have the site open where you intend to place this link, paste it into a Word document for safekeeping. Word will keep the link active, whereas Notepad renders it to a mere title. 3. Open the editor on your website. To create an image link, upload an image in the acceptable size and format. Place the image on your page and fill in the association linking it with the page address of your article. Depending on your link editor, right-clicking the image may open a dialog window providing a place for the link address and giving the option of opening it in the same tab or in another tab. Select 'open in another tab,' unless it is an internal link to another page on your site. You want to make returning to your site easy for your readers. You may have to highlight the image and click on a chain link in the toolbar to invoke a link editor. Creating a text link works the same way. After you enter your title, you would either right-click the title block or highlight the text and click the chain link to invoke the link editor. Preview your addition, to see if the image looks good and that the link works. ﻿4﻿. 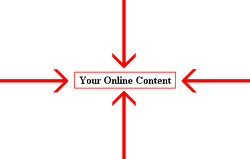 ﻿Add auto-backlink/copyright code to your pages. 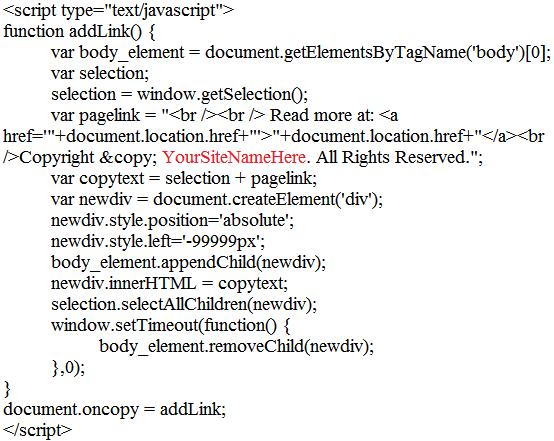 In the Advanced Settings section of your site editor, add the code in the image to the Header Code section of each page. When someone copy/pastes text from your page, the following notification appears. Change the red text in the code image to the left to alter the text shown below. Copyright © ﻿﻿YourSiteName﻿. All Rights Reserved." ﻿5. ﻿Update your keywords & keyphrases to include 'making money, online business opportunity.' Add other high value keywords that relate to your articles. 6. Add a Zazzle, Amazon or eBay store Widget, if you've got a store, to your website, Blog or Profile. 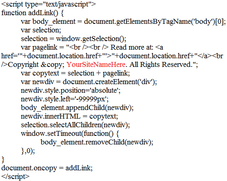 Anywhere you can enter HTML code. The Widget allows you to display your items in a scrolling slide-show. You can embed resulting code anywhere you have editing permissions online. Network Marketing at it's best! * Use Bookmarking and Sharing services, such as AddThis or ShareThis, to make it easy for readers to create backlinks for you. * Don't forget to submit your own website address to Google, Bing and MSN. The 'big three' search engines. * Besides submitting your website address, submit your sitemap to show the search engine bots what your site is made of.